As we enter spring, gardens are growing and blooming thanks to the efforts of their caretakers. While many include both perennial and annual blossoms, the daisies, peonies and roses that come up year after year truly offer a beautiful return on investment for gardeners. For nonprofits, this brings to light similarities with donors and donor care. While your nonprofit garden is undoubtedly populated with annual and perennial donors, caring for those that come back year after year is especially important. 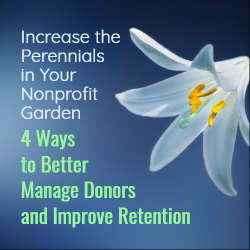 Typically about three out of four first-time donors will turn out to be like annual plants, only giving once. 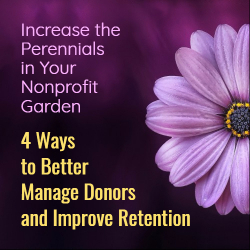 To maximize the impact of fundraising efforts, nonprofits need to focus on donor retention and making every donor a perennial donor. Just as gardens need water and fertilizer to thrive, donor relationships need appreciation. The power of acknowledgement lies in the backend of donation processing. Showing appreciation can come in many forms and should be appropriate for the donor’s level of engagement. Thank you letters are an important first step for all donors, and they need to be carefully tailored to take into account donor attributes, from gift size to specific campaigns or reasons for giving. Thank you calls can make a big impact as well, even leading to a 40 percent increase in donor retention, as revealed in Penelope Burk’s Donor Centered Fundraising. Whether showing appreciation through the phone, email or direct mail, it is critical that acknowledgements are timely, meaningful and personalized. Actively illustrating to a donor how their gift makes a difference helps cultivate a first time donor into a perennial supporter. At the same time, call centers can help address donor challenges, bringing wilting relationships back to life. Call centers allow nonprofits to respond to feedback from unhappy donors and resolve the challenges they’re having with a nonprofit in a way that may encourage continued donations. Often, busy nonprofits receive a response requesting to remove a prospective donor from a mailing list, and rather than explore the issue further, donors are quickly removed. However, by utilizing the call center, the nonprofit may discover that perhaps what the donor really needs is for the method or frequency of correspondence to change, preventing a lost donor by effectively responding to such requests. Gardeners know they need to keep plants safe from insects and animals if they expect them to grow, just as nonprofits know donor information must be protected. Trust is critical to maintaining donor relationships and this starts by physically and virtually securing donor information. Building a secure virtual environment can be achieved through basic data security practices, such as firewall, antivirus, or intrusion detection software. As many donations come in via credit card, following the Payment Card Industry Security Standards Council’s (PCI SSC’s) standards for processing credit card information is important. PCI offers a framework through its Data Security Standards (PCI DSS), which takes a comprehensive look at security and can ensure credit card information is properly handled and protected. Physical surveillance and reliance on trusted employees are also key in locations where donor data and donations are handled. This means maintaining 24/7/365 video surveillance, GPS tracking on donation-carrying vehicles and background checks on individuals handling payments. From the start, establish trust between the donor and your organization by safeguarding payments and personal information so potential issues are minimized. As a result, donors will be more likely to make a long-term commitment to a nonprofit’s mission. Plants need the right amount of room and flexibility to blossom – and so do donors. Sustainer programs are growing in popularity as they make giving easier for donors, while also ensuring a more reliable, predictable stream of funding for nonprofits. However, without the right back end support, these types of programs can quickly become frustrating for both parties. Recurring gift programs should offer donors the flexibility to give whenever and however they choose, encouraging participation. Back end support also needs to account for common issues, like expiring credit cards, taking care of necessary updates without putting an additional burden on the nonprofit or letting planned donations lapse. Sustainer donors have many of the same needs as other donors, such as quick acknowledgement and being shown appropriate gratitude, but unfortunately these needs are occasionally overlooked in recurring giving programs. A stronger back end management solution can help prevent this from occurring, allowing sustainer programs to flourish. In order to move forward with your mission, nonprofits should remember that successful fundraising begins with the back end. When nurtured, first-time donors turn into long-term gift givers. 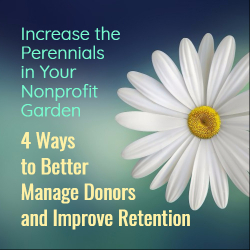 With appropriate acknowledgement, call center utilization, security and recurring gift program management, nonprofits can improve donor retention and see their organizations flourish.